Flood Lights and Lanterns are hung. The electricians return to install the outdoor lighting. Several low-wattage lights are placed on the outside of the house, next to the garage door, patio door and front door, all switched inside. As we have a large yard surrounded by a wooded area, we opted to have a dual flood light installed on the back corner of the house as added security and to help identify and chase away any “bumps in the night� from local wild-life. Although the exterior lighting on your home will offer decorative elegance and warmth, the utility of well placed lighting will enhance the security of your home. Streetlights offer some area lighting of your property, but will most likely not illuminate the sides or back of your home. Motion sensor or switched flood lights can be positioned to fill these gaps and offer an added level of protection. A well lit driveway and front porch can go a long way preventing theft or other crime related problems, as people tend to be very vulnerable, with a false sense of security when they are entering or exiting their homes at night. The safety of your family should always be among your top priorities. There are a number of ways you can ensure the security of your home. One of which is making sure that you have enough light outside your home. Having enough light to illuminate your home is imperative to keep the area bright to prevent intruders and worse, burglars from snooping around your property. In addition, your house will benefit greatly in terms of aesthetics from having ample lighting. Here are some of the factors that you have to look into so that you can make sure that you enough light outside your home. One of the first things that you must do is to figure out the exact locations where you want to install the lighting fixtures to provide ample lighting. 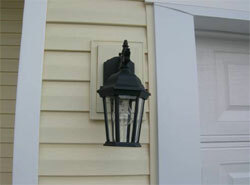 It is important that you install lighting fixtures to all of your walkways, doorways, and garage doors as well. Your driveway is another important area to place proper lighting. A motion detector light is best for this area. This will help people see where they are going when they enter the area of motion detection. It will also let you know when there is movement outside of your home. Another factor you must decide on is the amount of light that you will put in a specific location. As you may know, larger areas command more need for lighting. Thus, in this regard, you may want to give more lights to your garden area and front yard for instance. The next consideration is the type of light that you are going to use. You have a variety of choices here. Floodlights, pole lights, path lights, spotlights, decorative lights and porch lights among others are some of the different lights available. Lighting can be electrical, but you can also use solar lighting as an option. Bear in mind that it is important that you make it a point to buy the right size of lights as well. Your property or house will not be properly illuminated if you buy lights that are too small for a certain area. In the same manner, you would not want your electric bills to skyrocket unnecessarily because you put in too much lighting. It is best if you have lights that are fully equipped with motion sensors as well. This is actually beneficial in quite a number of ways. For one, it will significantly lower your electric consumption. Thus, you will not have to pay a large amount of money for your monthly electricity bill. In the same manner, this will give your home even tighter security. You can just adjust or customize the settings in such a way that they will not be sensitive to your pets or other animals roaming around your house. Lighting is an important feature and the fixtures you choose will probably remain in the location you place them for a long time. Make sure to visit your local lighting stores or building supply stores to explore all of your options. Seeing the lighting fixtures in person will help you determine what type of light best suits your needs.